The Xtreme XR742 (R) has a 7,000 lbs. (3,175 kg) lift capacity, a maximum lift height of 42 ft. (12.8 m) and a forward reach of 26 ft. 11 in. (8.2 m), while the Xtreme XR944, which replaces the Xtreme XR842, has a 9,000 lbs. (4,082 kg) lift capacity, a maximum lift height of 44 ft. (13.4 m), and a maximum forward reach of 28 ft. 10 in. (8.7 m). 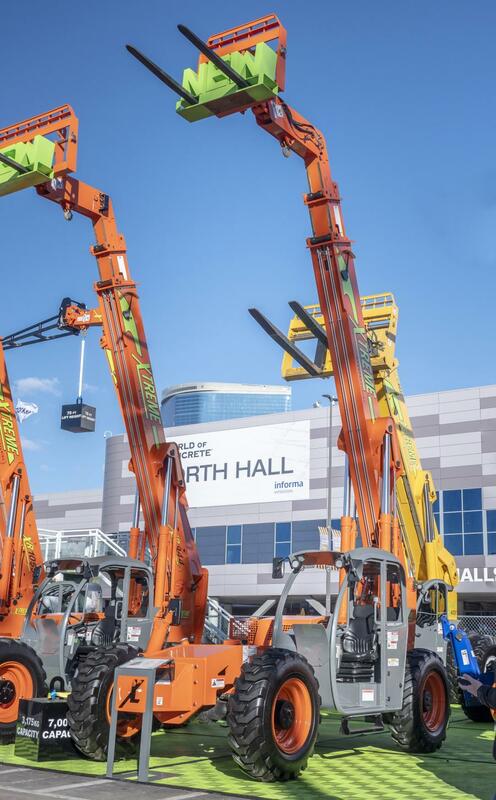 Xtreme Manufacturing debuted two new B-Class rough terrain telehandlers at World of Concrete 2019. The Xtreme XR742 has a 7,000 lbs. (3,175 kg) lift capacity, a maximum lift height of 42 ft. (12.8 m) and a forward reach of 26 ft. 11 in. (8.2 m), while the Xtreme XR944, which replaces the Xtreme XR842, has a 9,000 lbs. (4,082 kg) lift capacity, a maximum lift height of 44 ft. (13.4 m), and a maximum forward reach of 28 ft. 10 in. (8.7 m). Both models utilize a common chassis design that also is used on the Xtreme XR1055 and XR1147, improving familiarity across the product range and reducing spare parts inventory when operating a fleet. They feature a three-section boom with long-life boom rollers as standard, and both are electric over hydraulic, with fully automatic transmission. They also share a common control system with the XR619, XR1055 and XR1147. Designed for tough job sites, the XR742 and XR944 are equipped as standard with a Cummins 3.8L 74hp high torque Tier IV Final engine. An optional 120 hp engine is available on both models. Ideal for working on uneven terrain, both telehandlers have a ground clearance of 16.5 in. (41.9 cm) and frame leveling up to 11 degrees left to right, as well as a suspension seat as standard to ensure a comfortable ride for the operator. Common with all Xtreme telehandlers, the XR742 and XR944 have 360 degree operator visibility from the cab, intuitive controls that enable the operator to keep one hand on the steering wheel at all times, and a machine-rated boom lift point for safe handling of suspended loads. Offered with a choice of three cab configurations — open, enclosed or enclosed with heat and air conditioning — these models can be fully customized with a wide range of carriage, fork tine, tires and attachment options, including truss booms, pole grapples, buckets and personnel platforms. With preliminary weights of 27,000 lbs. (12,245 kg) and 28,700 lbs. (13,018 kg) respectively, the XR742 and XR944 are built to last. Both models feature a steel construction, as well as steel hydraulic and fuel tanks, and are backed by Xtreme's 10-5-2 warranty. Shown as prototypes at World of Concrete 2019, they are scheduled to commence production at Xtreme's facility in Henderson, Nev., in Q2 2019.